It’s here! Later than usually because of the exciting World Cup in Brazil, but we can finally present to you the list of Europe’s biggest clubs. Biggest not by score or budget, but by attendances. Which correlate with both money and success, don’t they? Well, thankfully not entirely. This is where the 10+ Ranking shows the great side of football as we reveal that passionate Rangers or Portsmouth supporters aren’t giving up on their clubs after dramatic relegations. Quite the opposite – seeing crowds of almost 43,000 per game in the third league of Scotland is stunning, just like Portsmouth’s 15,460 in English 4th tier. Of course the impressive cases are rather few among the 229 clubs that crossed the 10,000 average crowd. But then again, drawing 10,000 people week after week is still a great result. This year’s list has exactly the same number of clubs as last one, which represent 31 leagues in 24 European countries. 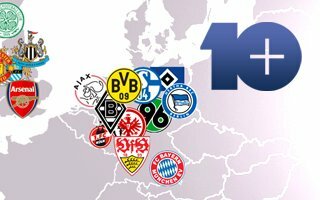 As it’s been for years now, England has the highest number of football clubs in the pack (45, one in five of all 10+ clubs), but Germany has the largest clubs (10 among top 20). This year’s edition of the 10+ Ranking also includes 15 leagues with average game audience of 10,000+. Both Bundesligas are here, the higher one being the most attended league one more time with 43,490 people per game. Second Bundesliga is Europe’s 7th highest league, winning with English Championship just like the first Bundesliga leaves Premier League behind. Details may be viewed in the table below. It’s becoming clear that France’s Euro 2016 puts the country on a fast lane to build one of Europe’s strongest leagues, gaining nearly 2,000 spectators more per game than in 2012/13, even before stadium projects are delivered. Great progress may also be seen in Russia and Turkey, where there are more new stadiums under construction than anywhere else on the Continent. Though Russian Premier Liga lost some spectators in 2013/14, this is largely because of all Moscow based clubs apart from Lokomotiv playing at temporary venues as four stadium projects in the metropolis are ongoing. You might call it stable, boring, stagnant, but Europe’s top 10 clubs is pretty much the same every year. This time none of the 7 biggest clubs changed their position in Europe. First refreshing changes come with 8th and 9th Borussia Moenchengladbach and Hertha Berlin. The latter club saw one of Europe’s largest increase in tickets sold. 11,800 people more at every game is a great success, but not the greatest in Europe. That one is reserved for RC Lens, who nearly doubled their crowds from 2012/13 by winning promotion back to Ligue 1. Another impressive change comes from Nice, where opening of Allianz Riviera gave OGC Nice a great boost. German Fortuna Dusseldorf is the least fortunate club by attendance. The side lost over 12,000 people per game after relegation. Further great losses come from Italy (Hellas Verona, Palermo and Fiorentina) and Ukraine (Shakhtar, Metalist and Chernomorets), also visible in Poland, where Śląsk is only filling a fourth of the Euro 2012 stadium. As mentioned above, we decided to honour teams that stand out in comparison to their counterparts across Europe. This is why the below image presents the very biggest crowd-drawers in each tier of professional football. Second, third and fourth league teams with crowds of this magnitude surely deserve a mention! 1 - attendances from the 2013/14 campaign (or 2013 for countries playing in Spring-Autumn system) presented in bold, increase/decrease compared to 2012/13 presented in brackets. Data collected primarly from official league reports by - among other - The Premier League, The Football League, DFB, LFP, KNVB. Where official data wasn't possible to find, figures from European Football Statistics and WorldFootball.net were used.